Citation Information: JCI Insight. 2017;2(3):e90905. https://doi.org/10.1172/jci.insight.90905. In the central nervous system, endothelial cells (ECs) and pericytes (PCs) of blood vessel walls cooperatively form a physical and chemical barrier to maintain neural homeostasis. However, in diabetic retinopathy (DR), the loss of PCs from vessel walls is assumed to cause breakdown of the blood-retina barrier (BRB) and subsequent vision-threatening vascular dysfunctions. Nonetheless, the lack of adequate DR animal models has precluded disease understanding and drug discovery. Here, by using an anti-PDGFRβ antibody, we show that transient inhibition of the PC recruitment to developing retinal vessels sustained EC-PC dissociations and BRB breakdown in adult mouse retinas, reproducing characteristic features of DR such as hyperpermeability, hypoperfusion, and neoangiogenesis. Notably, PC depletion directly induced inflammatory responses in ECs and perivascular infiltration of macrophages, whereby macrophage-derived VEGF and placental growth factor (PlGF) activated VEGFR1 in macrophages and VEGFR2 in ECs. Moreover, angiopoietin-2 (Angpt2) upregulation and Tie1 downregulation activated FOXO1 in PC-free ECs locally at the leaky aneurysms. This cycle of vessel damage was shut down by simultaneously blocking VEGF, PlGF, and Angpt2, thus restoring the BRB integrity. Together, our model provides new opportunities for identifying the sequential events triggered by PC deficiency, not only in DR, but also in various neurological disorders. 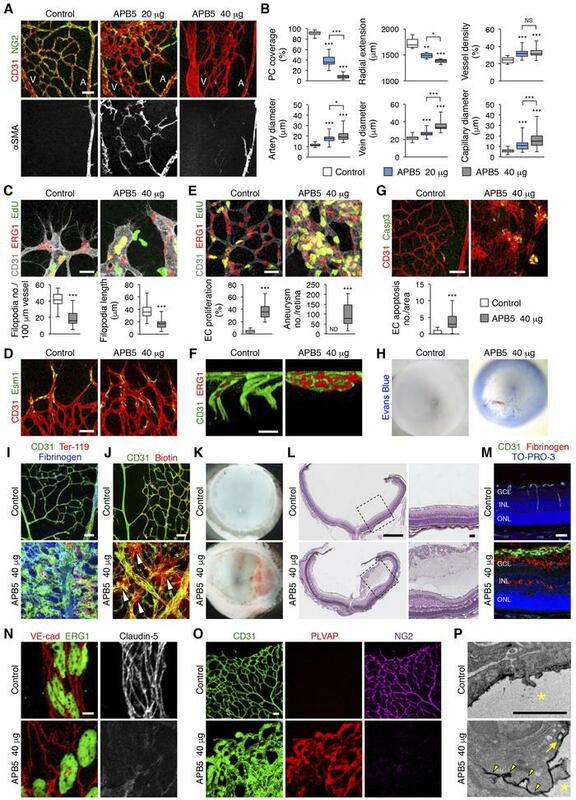 Inhibition of pericyte (PC) recruitment during retinal vascular development. (A) IHC for CD31, NG2, and α-smooth muscle actin (αSMA) at P5. A, artery; V, vein. (B) Quantification of PC coverage (n = 24 areas), radial vascular extension (n = 6 retinas), vessel density (n = 24 areas), and diameters of arteries (n = 30), veins (n = 24), and capillaries (n = 120) in P5 retinas. (C) Labeling for CD31, Ets-related gene-1 (ERG1), and 5-ethynyl-2′-deoxyuridine (EdU) at the sprouting vascular fronts of P8 retinas. The graphs show quantification of the number (n = 24) and length (n = 120) of filopodia in tip endothelial cells (ECs). (D) IHC for CD31 and EC-specific molecule 1 (Esm1) in P5 retinas. (E) Labeling for CD31, ERG1, and EdU in the central areas of P8 retinas. The graphs show quantification of EC proliferation (n = 24 areas) and aneurysm (n = 10 retinas). ND, not detected. (F) 3D images of retinas labeled for CD31 and ERG1. See also Supplemental Video 1. (G) IHC for CD31 and cleaved caspase-3 in P8 retinas. The graph shows quantification of EC apoptosis (n = 16 areas). (H) P8 retina cups 24 hours after Evans Blue injections. (I) IHC for CD31, Ter-119, and fibrinogen in P8 retinas. (J) IHC for CD31 and biotin in P8 retinas after biotin perfusion. Note the focal biotin leakage (arrowheads). (K) Retina cups at P10. (L) H&E staining of paraffin sections of P10 retinas shown in K. Right panels show magnified views of the boxed areas in the left panels. (M) IHC for CD31 and fibrinogen with nuclear labeling in cryosections of P10 retinas. Note the defects in vertical vascular sprouting, and fibrinogen deposition over the ganglion cell layer (GCL) and within the inner nuclear layer (INL) of the APB5-treated retina. ONL, outer nuclear layer. (N) IHC for vascular endothelial cadherin (VE-cad), ERG1, and claudin-5 in P8 retinal veins. (O) IHC for CD31, plasmalemma vesicle–associated protein (PLVAP), and NG2 in P8 retinas. (P) Transmission electron microscopy of P8 retinas after biotin perfusion. Note the deposition of electron dense tracers in disrupted EC junctions (arrowheads) and intracellular vesicles (arrow). Asterisks indicate vessel lumen. *P < 0.05, **P < 0.01, ***P < 0.001 (1-way ANOVA in B; 2-tailed Student’s t test in C, E, and G). Scale bars: 500 μm (L, left); 50 μm (A, D, G, I, J, L right, M, and O); 20 μm (C, E, and F); 5 μm (N and P).